Headstones today come in a variety of materials and when choosing what to use for your loved one’s memorial a number of factors need to be taken into account. Granite is a popular choice of material due to it being such a hard material, it is available in a wide range of colours and can be polished, honed or pitched. It is also far easier to source nowadays, bringing costs down for masons meaning those savings can be passed on to you. Cemeteries are usually flexible in the types of material allowed when it comes to headsto nes, some Churchyards may not allow it. Granite is very durable it is easy for a family to maintain and it will look good for years to come. The lettering over time will require some maintenance if it has been gilded or coloured, but this can easily be done in the cemetery by an experienced mason. 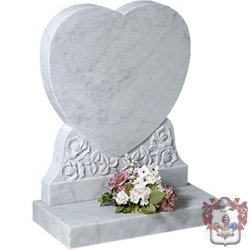 Marble headstones are white with grey veins and are unpolished. Cemeteries and most Churchyards allow marble memorials. Marble is a crystalised limestone so it is a porous material, overtime the marble will discolour if not maintained, a family can maintain a marble gravestone with a masons advice. Alternatively the family may ask a mason to periodically clean and refurbish the memorial to keep it looking in excellent condition. Traditionally a marble headstone will have a cut and leaded letter, a technique we still use at Sarsfield Memorials. Some masons will cut and paint the lettering, but this will wear away very quickly so it is an ongoing cost to have the lettering painted. Other materials allowed in Cemeteries and Churchyards are Nabresina, Portland Stone, Yorkstone and Slate. These materials are not as popular in the Merseyside area as they are in other areas of the country. If you would like a traditional style gravestone then these materials are the most suitable. Although marble and stone are more prone to the elements than granite, that should not mean you eliminate them completely when making your headstone choice. With the correct care and attention, they are made to last. If the wrong materials are used for cleaning memorials then you can contaminate the stone and can damage your headstone beyond repair. It is always advisable to ask your experienced mason how to maintain your gravestone. At Sarsfield’s we have samples of all of the stones mentioned, allowing you to look and handle the material to see which you prefer. You can also see photographs of our work which we have completed, with these options available and our knowledge we hope we can help you make the right decision when choosing a gravestone. Please contact us for a free no obligation quotation. Rake Lane cemetery in Wallasey is the scene of many war graves, the most recent of which was unveiled in January 2016 when an army medic had a headstone erected by the Commonwealth and War Graves Commission (CWGC). The CWGC had previously identified 255 casualties of the two world wars buried in Rake Lane cemetery. There are additionally a number of casualties of the Crimean, Boer and there is a war memorial situated near the chapel. The cemetery also contains the graves of a number of others connected with both world wars who did not die on the battlefield. In May 1915 the sinking of The Lusitania, bound for Liverpool from New York, turned the tide of public opinion in the United States against Germany. Over 1,200 lives were lost when the liner was sank by a German u-boat. Among the 764 survivors was Captain William Turner, who had been with Cunard since 1883. Although the Admiralty tried to pin the blame on him, saying he had been in an area where u-boats were known to operate and too close to the shore, he was exonerated at the Board of Trade investigation. In summing up Lord Mersey placed the blame solely at the hands of the German government and said that Turner had exercised his judgement to the best of his ability. Turner was buried in Rake Lane after he died in 1933 and his memorial refers to the fact he captained the vessel. Much closer to home, there was a disaster in Liverpool Bay on 28th December 1917 when the Liverpool pilot boat Alfred H. Read, which had been commandeered by the War Office, struck a mine and sank in minutes. 39 crew members perished, just two being saved. Seven of those whose bodies were recovered are buried at Rake Lane. As war clouds gathered over Europe in 1939, the Cammell Laird built submarine HMS Thetis went on dive trials on 1st June but sank off the coast of North Wales, leading to the deaths of 99 of the 103 men on board from carbon dioxide poisoning. Most of the victims were buried in Anglesey but two engine fitters, Cornelius Smith and John Griffiths, were brought back to Wallasey and buried there. The Thetis was intentionally grounded on 3rd September, the day Britain declared war on Germany. After being repaired she was recommissioned as the Thunderbolt and after operating in the Atlantic and Mediterranean she was sunk off the coast of Sicily in 1043. During the Second World War the Luftwaffe bombed Wallasey on 35 occasions, leading to the loss of 324 lives. The most sustained period of bombing was in March 1941 when 186 were killed over three successive night when parachute mines were used. The last raid took place on 1st November 1941 and a memorial is situated in the cemetery, where the remains of 51 of the victims are buried. All these headstones connected with war related deaths have now in 2016 been joined by the CWGC memorial to Staff Sergeant Wilfred Cooke, unveiled on 21st January 2016. Cooke served with the West Lancashire Field Ambulance in France and Belgium. He was awarded the Military Medal and two Distinguished Service medals before being discharged due to wounds illnesses contracted at the Front. When he died of Tubercolosis on 26th July 1920 he was buried in an unmarked grave, but 95 years on his service and bravery have been formally recognised. Should you be in the tragic situation of losing a child, there is now some comfort in that cemeteries are a lot more flexible in the type of memorials and ornamentation that are allowed on children’s graves. Gone are the rigid rule s of days gone by when the only indication that a headstone was that of a child was the inscription indicating age and a possible symbol of a cherub. Nowadays memorials often come in the shape of teddy bears and stars, we can also offer unusual design gravestones including a piece of a jigsaw puzzle or a children’s television or story book character. There is no need to consider just a general headstone, as memorials can also be made in the shape of cars, trains and butterflies to name a few. In cemeteries where kerbsets are allowed, coloured chippings can be added allowing extra space at which you can place extra ornamentation, vases, memorial plaques, the child’s toys or windmills. There is an almost unlimited range of symbols that can be etched onto children’s gravestones. Winnie the Pooh characters are common, as are Thomas the Tank Engine and Fairies. However it also possible to etch or carve favourite cartoon characters or your childs’ preferred toy onto gravestones, or a photograph or laser etching of your precious son or daughter. When it comes to inscriptions, ‘in the arms of angels’ and ‘held for a moment, loved for a lifetime’ are two examples of what can be used on children’s and babies headstones. It is becoming increasingly common to see more brightly coloured lettering on children’s memorials. Often families find comfort in making a gravestone colourful and very personal, as you do not want to visit the cemetery and spend a lifetime of sadness visiting a grave; Instead you want to think of the precious moments you shared and what life could and would have been like if your precious baby or child had lived. You will always see a final drawing showing the memorial before we carry out the work, this gives you time to reflect before the final gravestone is made and lettered. All our memorials are made out of the finest quality materials and fitted to NAMM standard. If you require further information or just an informal chat please contact us. Choosing an inscription for your loved one’s headstone is a difficult and emotional task that you will want to get right. Summing up their life and your feelings in just a few short sentences is not easy, but there are some simple steps to follow that can assist with you in making your choice. In terms of the number of words, it is important to remember that the more inscribed, the less space there is for future inscriptions. As such , it is advisable to use a few short sentences to sum up who your loved one was and how their life is remembered by their surviving family members. Epitaphs need not be just a few words, but could be a couple of line s devoted to the bereaved’s memory of their loved one. Phrases that could be used include ‘Tenderly I treasure the past, with memories that will always last’ and ‘As time goes on, the days pass by, but memories of you will never die.’ The epitaphs could also refer to how a person died instead of or as well as, how their loved one’s feel. A person who died after a long illness for instance, could have ‘Peacefully sleeping’ on their gravestone. Alternatively, for somebody who died suddenly as a result of an accident, ‘Taken suddenly’ would be appropriate. On many Victorian headstones there are inscriptions referring to the deceased having ‘departed this life’, indicating the faith in the afterlife. Today, a person’s faith can be demonstrated with numerous phrases such as ‘Only goodnight beloved, not farewell’, ‘I know that my redeemer liveth’ and ‘Safe in the arms of Jesus.’ For headstones on graves where more than one family member is buried, a simple ‘Reunited’ or ‘Together in heaven’ can often suffice. When considering the quotes, you do need to appreciate that what is inscribed will be a permanent memorial and reflection of your loved one, so it is important to make the right choice. If the deceased had not indicated themselves what they may want inscribed on their headstone, try and imagine how they would think, and work something out from there. Sarsfield’s masons have been providing headstones and inscriptions for three generations and can offer advice on what may be best for your loved one’s memorial. Please contact us for a chat on the phone or by email, for a free no obligation quote or to make an appointment for us to visit you.